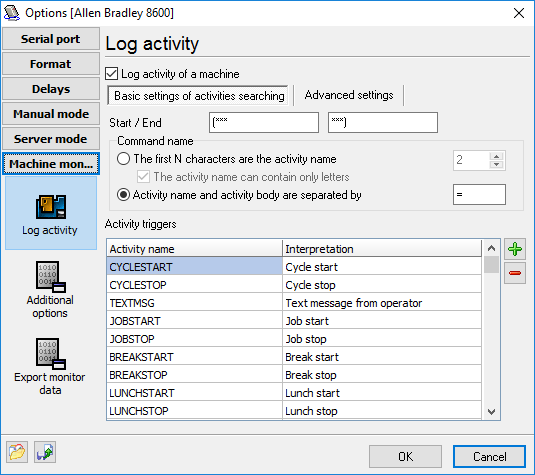 The DNC Precision Machine monitor function utilises the Fanuc Macro-B functions to passively monitor Cycle start, Cycle stop, Tool change and other events that your machine can generate. The following describes how to set it up. then the CNC doesn't recognize the POPEN key word, and you don't have the option. If you use certain O-numbers for these macros, you can also assign a custom G-code or a custom M-code to automatically call them. In some cases, you won't even need to modify your programs at all. For example, if all your programs have a certain G-code at the beginning (say, "G20" for Inch programming), you can just put the number "20" in a parameter to make "G20" always call macro 9010. In a similar fashion, you can have the control call the "CYCLESTOP" macro with the M30. The parameter locations for these settings are different in each model Fanuc control, so you will have to look them up in the manual. On the DNC side, just keep the port open and listen for the word "CYCLESTART" or "CYCLESTOP" (followed by a Line-Feed) then record the event in a file with the Date and Time variables from the PCs internal clock. You can then go back later and analyze all these events and calculate how many cycles you have, average cycle time, average load time, etc. We even tie this into our automatic paging and e-mail software so someone can get a page or e-mail if the machine has been idle for more than (x) minutes. You can use a small relay and connect it to the signal that powers the "in cycle" light bulb or LED on the operator's panel. This relay then turns on one of the unused handshake lines on the RS232 cable (say, pin #8, or CD). Our DNC software just watches this signal, and knows the CNC is in cycle if it's on, and out of cycle when it's off. In this case you can't use activity triggers and can use cycle start/stop monitoring only. You can enable this feature on the "Additional options" tab. Basic and advanced settings are very familiar with same settings of the server mode. Here, you can define rules, that our software will use to extract your activities. Please, note that you should use another format of activities if you are using the server mode, because your activity trigger names can interfere with NC commands in the server mode. It is an example only and you can define your own rules and activity triggers. You can use many build-in trigger names and their interpretations or define new one. For example you can define a trigger with name "A" and interpretation "Smoking" and the program will export this text to a log file. So you defined activity triggers. If you didn't define a trigger name, then the trigger with this name will not be exported. The DNC software will write this activity and tool number to a log file. The DNC software will write your custom message to a log file.